We’re one of the available charities you can support with a Give Card from Community Shares of Mid Ohio. The charitable gift card allows the recipient to contribute the money on the card to more than 50 local charities including [your charity’s name]. 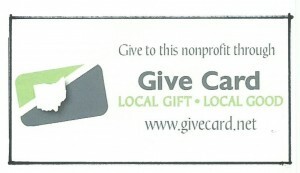 Discover how 1 local gift can lead to more than 50 good possibilities by visiting www.givecard.net. [Your charity’s name] is one of the more than 50 organizations people can support when redeeming a Give Card from Community Shares of Mid Ohio. Purchase your Give Card today at www.givecard.net. Give Different This Holiday Season! Community Shares of Mid Ohio is offering a new way to give back to local charities, like [your charity’s name] this holiday season. The Give Card is a unique way to recognize any occasion just like a regular gift card. Instead of purchasing an item, the recipient can make an impact in the Central Ohio community by selecting which local nonprofit(s) receive the amount on the Give Card. Cards are available in any denomination to be emailed or printed out by the purchaser for personal delivery. Card recipients can redeem the card online to support [your charity’s name] or additional nonprofits available through Community Shares. Redeemers will also be able to contribute in addition to their Give Card amount to the nonprofit(s) they are choosing to support. Currently there are more than 50 member nonprofits available to support with the Give Card. All members provide programs and services in Columbus and Central Ohio with some even extending their offerings to the entire state of Ohio.